There is perhaps no more relaxing adventure in Alaska than fishing from a drift boat. Drift boat fishing is an excellent way to enjoy Alaskan fishing and scenery. Our fleet is comprised of constructed by a manufacturer in Oregon. Our boats are sized at 20’ x 72″ a size that allows plenty of stability and maneuverability while navigating along the waters. The boat’s interior includes four seats for clients, a rowing seat for our guides and additional space for gear and moving about. Your guide will float you down river quietly over sections containing the largest number of fish. The best way to fish in Alaska! Holding the boat into the river current and slowly slipping backwards allowing the plugs and diver baits to work in the current behind the boat. 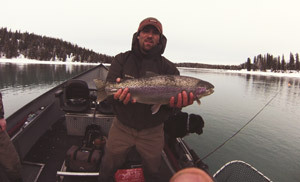 Turning the boat sideways in the current and throwing the weighted lures and bait upstream. The current moves the boat down river pulling the lures and bait down stream along the bottom. Bouncing bait or plugs behind the boat in the current, the weight hitting the bottom each time. FULL DAY DRIFT BOAT TRIPS (8hrs). Maximum is 4 people in July. All gear is provided by Corey. Drinks and snacks will be available on the boat. Only the essentials will the clients need to bring. Camera, light rain gear, appropriate clothing, fishing license, lunch.